Known as sakura, the cherry blossoms in Japan are popular with both locals and tourists alike. For the Japanese, sakura hold much cultural and historical significance that goes deeper than obvious beauty. It’s one of the more well-known symbols of Japanese culture, and the blooming symbolizes human life, transience, and nobleness. It’s also tied to Shinto ideals of impermanence, hope, and renewal. In addition to being a metaphor for the beauty of life, the health of the blooming is used to discern the quality of that year’s harvest. Cherry blossom season is one of the high seasons in Japan, and it’s easy to see why. The pink and white flowers found decorating the branches of sakura trees are utterly gorgeous, and it’s hard to not want to see them in all of their beauty. You’ll be surrounded by people no matter where you go to see them, but one of the best things about this time — aside from the cherry blossoms themselves, of course — is how respectful most people are toward each other. There’s a de facto understanding that everyone is there to enjoy unimpeded views of this natural wonder, so people try their best to see the flowers, get that perfect shot, and then let others enjoy the same courtesy. Here’s when to visit and where to go. Sakura are usually only in full bloom for about one week, after which they fall from the trees onto the ground. If you manage to catch the tail end of the blooming, you’ll be in for quite the treat — they’re so small and round that when they eventually start to fall, it’s almost as if you were watching snow gracefully descend from the skies. The fact that they’re only in full bloom for such a brief period will undoubtedly cause stress over getting the timing right, but it’s actually pretty easy to plan your trip around the blooming and guaranteeing you’ll be able to catch it. While the cherry blossom season occurs between March and May each year, the specific time varies from region to region. Luckily, the Japanese Meteorological Corporation (JMC) has done all the work for the rest of us, and each year it posts a forecast detailing when the blooming will begin in each region in Japan. The predictions aren’t just looking at the weather months in advance; it also depends heavily on temperature patterns. Depending on how the patterns change over time, the JMC will release updated forecasts with the most up-to-date information. The forecast above lists 14 major prefectures, from as far up north as Hokkaido down south to Kagoshima, with a well-known city in each one, such as Sapporo and Tokyo. For each location, the JMC has listed an expected flowering and full bloom date, as well as the average flowering date (taken from past years). The JMC actually tracks the blooming for approximately 1,000 locations across the country, and although the website is originally in Japanese, there’s a Google Translate button right near the top of the site. The website even goes one step further and allows you to track the growth progress from budding to full bloom through a flowering meter. The dates are unlikely to change too much, but give yourself a few extra days at each end of your trip to be safe. Many people hold flower-watching parties, known as hanami. There are a number of celebrations held in honor of the cherry blossoms’ blooming, so you’re likely to find a hanami party no matter where or when you go. What makes up a hanami party, besides sakura viewing, is eating and drinking. Groups of people will set up camp in a park by a river — essentially wherever the cherry blossoms are — and have a picnic under the trees. Some bring home-cooked meals, some make food on the go while picnicking, and others buy already prepared food. And, as public drinking is legal in Japan, most people bring sake or another type of alcohol to mark the occasion. 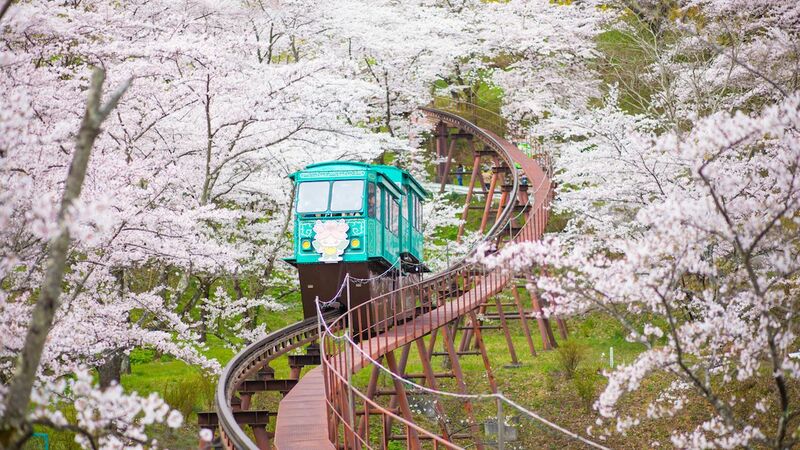 Of all the spots where you can see cherry blossoms, some of the most popular locations are Hokkaido, Tokyo, and Kyoto. Hokkaido is the northernmost island in Japan and is well known for its natural wonders, such as ponds with turquoise blue water, flower fields, waterfalls, and volcanoes. So it’s no surprise that an area abounding with such beauty will also be popular come springtime when the cherry blossom season begins. Tokyo is already a highly visited city in general and is included on most people’s itineraries when they visit Japan. Combining both Tokyo and sakura viewing is a great idea for making the most out of your time there, but you’re going to be sharing that experience with tons of other people. Kyoto is a remnant of an older time in Japan, and seeing a full bloom amidst the traditional architecture is an experience like no other, but many others will have the same idea. While there’s nothing wrong with visiting the aforementioned locations, and most spaces are usually large enough that you never feel truly crowded, there are definitely some underrated spots that will ensure you have an experience free of the masses and are just as magical, if not more. The Miyagi Prefecture, in the Tohoku region, is one of them. Its capital city is Sendai, and while it’s the second largest city in Japan after Tokyo, the vibe is completely different — everything is much more relaxed and easygoing. 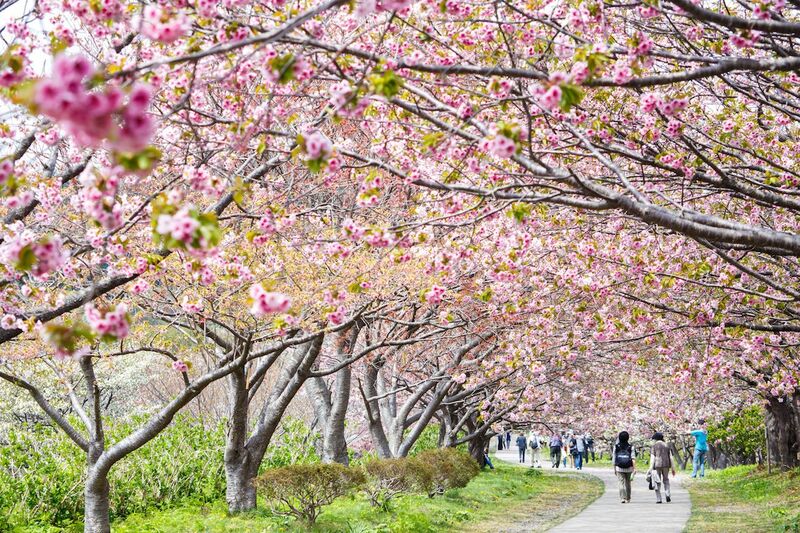 It gets its fair share of visitors in the summer months but is often overlooked in favor of locations like Hokkaido, Tokyo, and Kyoto during the spring season. Fukuoka is another example, located on Japan’s Kyushu Island. Because of its southern location, it’s thought to be too far out of the way for some. But if you’re thinking of including Hiroshima on your trip, then Fukuoka is an easy trip away. Depending on what train you take, the ride can be anywhere between an hour and three, but it’s completely doable and you’ll get those sweet, unobstructed views.